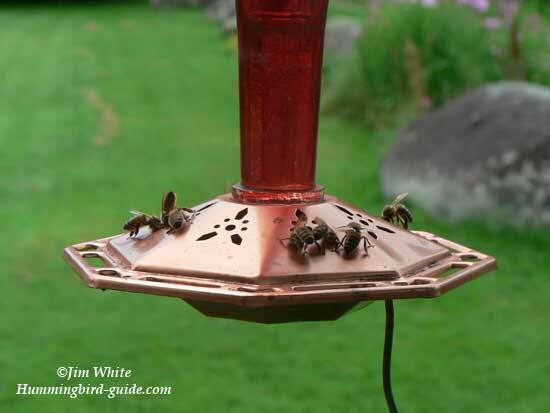 Hummingbird Feeder Bees. How to solve the problem. Keep hummingbird feeder bees away. Get results today! 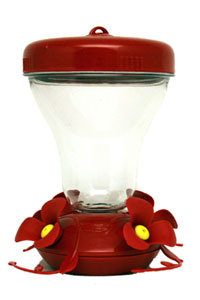 Varieties of bees such as honeybees, yellow jackets, hornets, and wasps are a serious problem at hummingbird feeders. 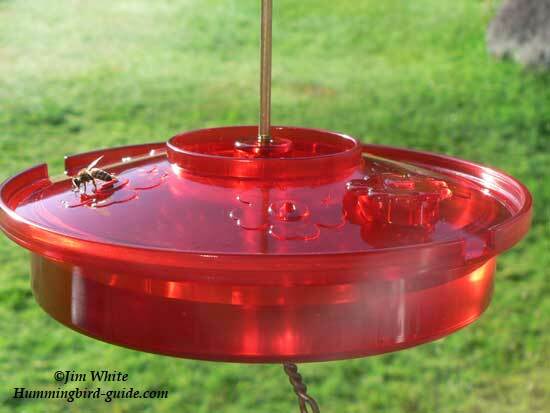 Worse yet, our hummingbirds sometimes desert a feeder infested with bees. Some cheap plastic feeders can leak when they are exposed to the elements. The sugar water mix is a liquid and will expand in the heat causing the feeder to leak. So check your feeder for leakage regularly. 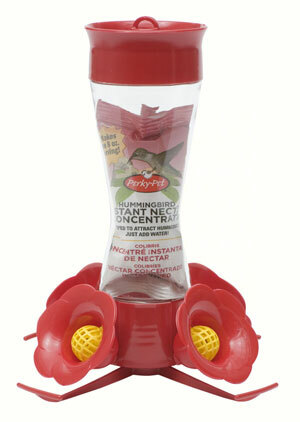 We recommend buying a better feeder that cannot leak such as the Dr.JB’s hummingbird feeder. 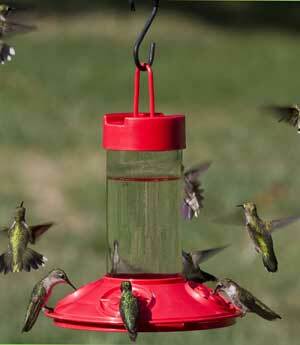 This feeder is a very good quality feeder, with a durability that will last for many years. Don’t use feeders with yellow decorations, especially those that look like flowers, as bees will investigate the flowers looking for food. Clean feeders and feeder ports. 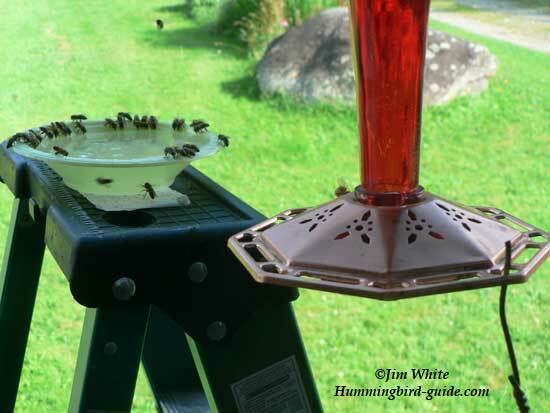 When you fill your feeders bring them inside and pour hot water over the feeding ports. This will remove the built up nectar that attracts bees. Then carefully wipe the outside of the feeder with a warm rag to clean it completely. You usually won’t find as many bees at a properly cleaned feeder. Here are some cleaning tips. Bees (especially honeybees) prefer feeders in direct sunlight. Move your feeder to the shade if possible. 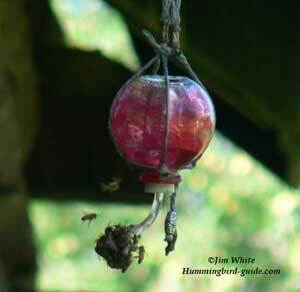 The photo above is an example of one of our feeders taken over by Honeybees. One of our neighbors has Honeybee hives. I don't think "good fences make for good neighbors" would help in this case! Our Experience with Honeybees taking over one of our feeders! Plan #1: As suggested by a website on Honeybees, we are going try making a nectar solution of 5 parts water to 1 part sugar rather than the usual 4 to 1 ratio. Supposedly, Honeybees will not be interested in this mix because the nectar content will not be high enough for their needs. However, hummingbirds are supposed to be satisfied with this ratio temporarily. If this works, and the bees have given up on the feeder, we will go back to the usual 4 to 1 ratio. As you can see in the photo below the 5 to 1 ratio of nectar did not work. Even after 5 hours, the bees were still occupying the feeder. So, plan #1 did not work. Plan #2: If step #1 fails, we will place a yellow dish (bees seem to be attracted to yellow) with 2 parts water to 1 part sugar in the same vicinity near the feeder on a ladder. If the bees take to this, we will remove the feeder and move the dish a few feet each day away from its location. Eventually, we will re-hang the feeder after a few days. Results: As evident in the photos below, this option seems to be working. 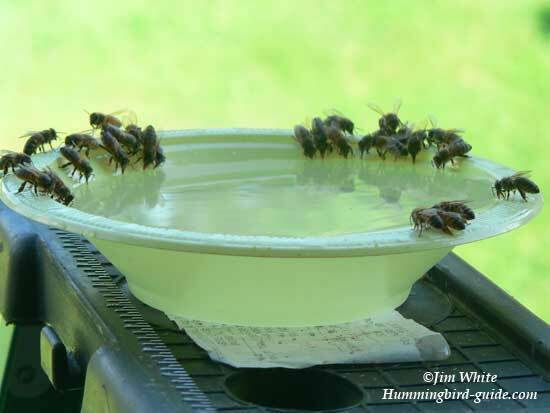 Within an hour the bees left the feeder to occupy the bowl with the 2 to 1 ratio of nectar. Plan #3: I hung the feeder again filled with the usual 4 to 1 ratio of nectar and the bees occupied both the bowl and the feeder. Since this happened, this step is to remove both the high concentrate nectar bowl and the feeder until the bees give up and search elsewhere for a nectar supply. The Honeybees on our "BirdCam" searching for the nectar in the feeder. Plan #4: I left no feeders hung and available to the bees for one (1) day and decided to hang a "Tray Feeder" to test the "Bee Resistance" of this style feeder. Results: I can say that they are definitely resistant to bees since the bees (wasps, hornets, yellow jackets) cannot reach the nectar through the ports. The level is too low for them to reach. At first there where many bees trying to get to the nectar but as time went by there were fewer and fewer bees at the feeder. Within an hour the newly displayed feeder was visited by our hummingbirds as seen in the photos below. 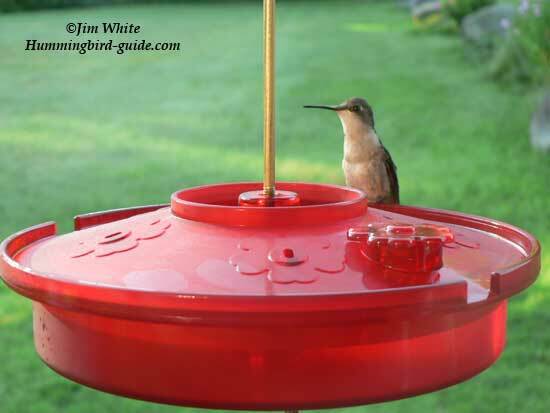 A Female Ruby-throated Hummingbird visiting the newly displayed tray feeder. 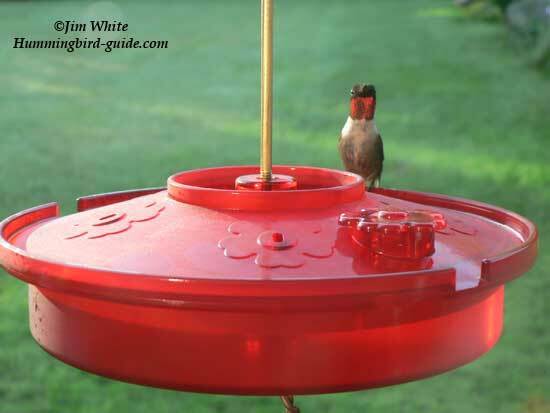 A Male Ruby-throated Hummingbird visiting the newly displayed tray feeder. Use a Tray or Dish Feeder. Put out a plate or bowl of more highly concentrated sugar water such as 1 part sugar to 2 parts water. Yellow is best if you have one because bees are attracted to yellow. We have heard of people using apple juice because of the yellow color. This would be easier but something we have not tried personally. Let us know if you try it. 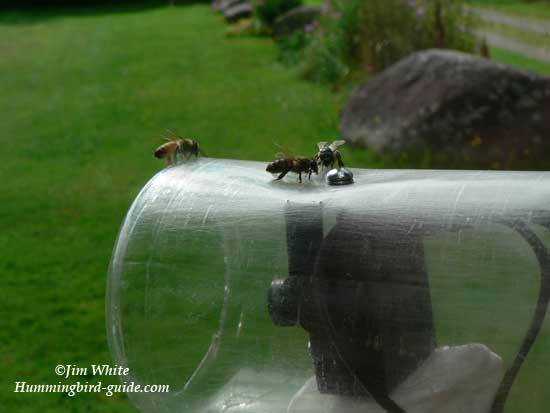 Use a bee guard or a feeder with bee guards. We feel that one of the simplest and least time consuming answers to a bee problem is to buy bee guards. A Bee guard is a mesh or plastic that prevents the bees from accessing the nectar. The syrup level is too low for bees to reach it with this barrier but the hummingbirds can use their long tongues. 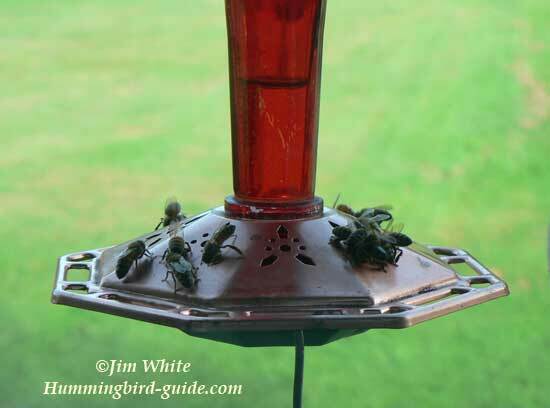 Some of our visitors told us that they put out more feeders for the hummingbirds and simply allow the bees to have their own easily accessible feeder. People also paint the feeder ports yellow on the feeder for the bees. 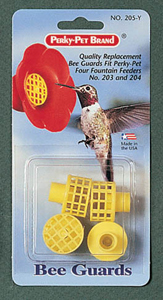 There are feeders available with yellow feeding ports. Note: We have never tried this but if there is an easy access feeder for the bees, it makes sense that they will us this feeder instead of the other feeders that are not so accessible. Honeybees on our "Homemade Feeder"
Hummingbird Feeder Bees prefer flowers. Many bees prefer flower nectar to feeders. Planting a hummingbird flower garden will satisfy some of the bees. Hummingbird flowers have a good nectar count that is enjoyed by both bees and hummingbirds. Here you will find a list of hummingbird flowers listed by growing zone. For those of you who are new to gardening, this page will list the flowers that grow where you live based on climate and growing conditions. Hummingbird feeder bees, yellow jackets, hornets, and wasps enjoy nectar but can sometimes sting, especially if they sense danger. Be extra careful around them. Some of us, myself included, are allergic to bees and should avoid them whenever possible. 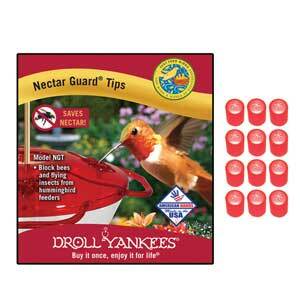 DO NOT USE INSECTICIDES or other poisons in or around your hummingbird feeders. Even though they are not ingested directly, these chemicals can harm the hummingbirds by breathing in the fumes. Did you know that the scent of the insecticide is meant to deter pests? Hummingbirds have no sense of smell, so they are especially vulnerable. They will not fly away when exposed. Hummingbirds preen (clean) their feathers regularly. If they come in contact with the chemicals and then clean the feathers with their tongue, this is another way they can become ill.
Hummingbird feeder bees, wasps, and hornets annoy us but they are nature’s pollinators too. 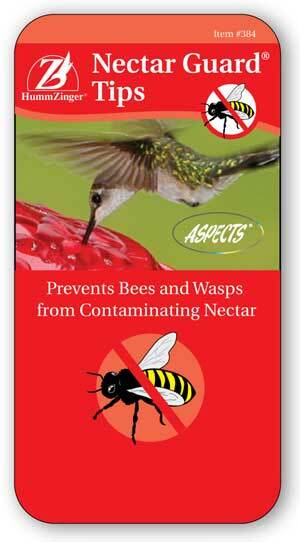 By using the more natural methods mentioned here, we can avoid killing both the bees and hummingbirds. Mother Nature Will Be Happier Too!! !